In a renovated period building in the heart of the city centre, where you can relax between one excursion and another with cosy cafes and restaurants. Macellum B&B also has a special partnership with the nearby 'Mercato Pompeiano' restaurant to offer its guests a unique experience while tasting the best of Italian products. The restaurant is open for lunch and dinner.Access to the B & B is allowed at any time, 24 hours a day; no limits therefore to your holidays, you will be totally independent.For business, tourism or culture, whatever the reason that brings you to Pompeii, Macellum Bed and breakfast is pleased to welcome you in a warm and friendly atmosphere. 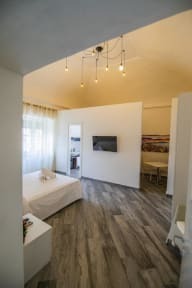 Centrally located, comfort and proximity to the points of tourist interest, these are the key terms of the B & B Macellum. Very spacious rooms equipped with every need.Private bathrooms with large windows and full courtesy set.Balconies with a view of the Mariano Sanctuary.The rooms have also flat-screen TV of the latest generation, free WiFi, air conditioning. The double room is suitable for a couple and the quadruple room is suitable for families as consists in a large double bed and a sofa bed.